It never occurred to me that 떡볶이 is such a funny-sounding name! only until I typed it in English above and tried to pronounce it as if I don’t know Korean at all. I felt like my jaw is dropping after each syllable, didn't you? Despite this seemingly hard-to-pronounce name, tteokbokki (spicy ricecake casserole) is a widely popular street food in Korea especially loved by children and young adults. In fact, if you are in Seoul and are walking on streets, you would find it hard not to notice one tteokbokki vendor on your way and would be easily tempted to make a short detour. I think Anthony Bourdain, too, had tteokbokki as his first meal in Korea when he was on his way to hotel from the airport even as he was much jet legged. 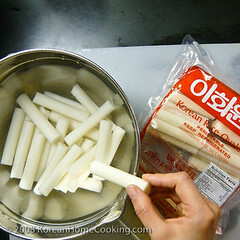 Distangle each rice cake stick and soak them in water for 20 minutes. On high heat add water (1c) and fishcake broth (1c). Stir in red pepper paste (2T). Stir in honey (2T), or instead you could use sugar (1T) and corn syrup (1T). Cut fishcake and leek. You could also add few slices of jalepeno (optional) if you like it spicy. When the broth is about to boil, add rice cakes and fishcakes and cook until the ricecakes become soft and chewy. Add leek and garlic. Reduce to low to medium heat and simmer for 5 minutes. Sprinkle black sesame seeds before serving. Thank you for starting this blog. I used to visit mykoreankitchen.com but Sue stopped posting there, I am glad you posted a link to yours. this is THE best dok bokki i have EVER had. i made it tonight and my husband agrees that this was better than any in the korean restuarants or new york city which we have visited! i can't wait to try more of your recipes! Thanks for your compliment. My husband also thinks this tteokbokki recipe is one of the best and asks me to cook them whenever we invite our friends over :) Though I modified a bit, I would like to give some credits to the Korean cookbook by Namool that I learned this recipe from. Migi, you are amazing. I spent an evening to check out your recipes ^^. I love Korean food, yeah, just like everybody does. I live in Japan and at my place I cant find any store selling rice cake >_<, which has made me crazy. I want to have it a try at home, instead of instantly going to restaurants @_@. 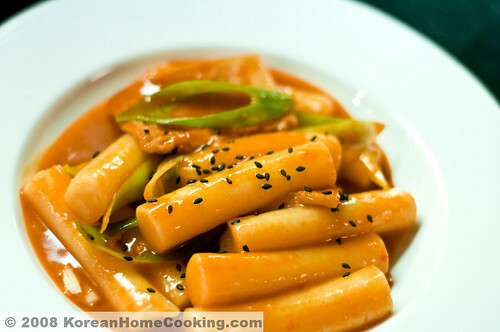 Could you pleaseeee help me a way that I can make Korean rice cake (as in Teokbokki)? Welcome to Mig's Kitchen. I wish I can ship you rice cakes from here ;) I will soon post a recipe to show you how to make rice cake at home. Thanks for your patience. God, I'm glad to hear from you. I heard that rice cake can be made with glutinous flour, and corn starch? no? Nyway, I'll keep up waiting for your recipe. Thanks so much. Migi - we adopted a baby from Seoul Korea last February. Luckly we traveled to Seoul (the last time I was there was 30+ years ago when my parent adopted me from Korea as well)to take in the culture and meet our baby for the first time. Needless to say my husband and I very much enjoyed our time in Korea and the food was truly soul food (for me). I made this tonight and tasted just like what we had on the streets of Seoul's Financial District. Thank you Thank you. I want my son to be proud of his Korean heritage and I am discovering my own Korean culture at the same time. I look forward to cooking your other recipes as well. Thank you again for this generous gift of posting your recipes. Hi, would you know how to make the actual rice cakes? is there a recipe you could share? thank you. Try this http://www.koreanhomecooking.com/2009/03/homemade-rice-cake.html as your guide to making the rice cake. But, note that adjusting water level in the rice dough could be a little tricky. Make sure you adjust the water level as you go along. Good luck! I just used your terrific recipie but I added a slight modificaton - after soaking the tteok to soften it, fry it in a tablespoon of oil for a few minutes until it's lightly browned all over. 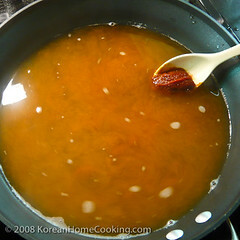 Make the sauce as usual, then pour it in the frying pan to coat the tteok. Still has that great tteok bok kki flavour but is crispy and chewy! Thanks Migi! I've tried your recipe and it's really good! Thanks for your comments! I think, frying tteok before adding sauces would make the dish taste like Skewered pan-fried tteok (떡꼬치) with chili sauces. That used to be one of my favorite street foods in old days. Thanks for sharing the recipe! You are welcome! I am so glad. Thank you for this recipe! I just cooked this tonight and it was amazing!!! I added mushrooms and onions as well.. My fiance was in heaven. My new personal goal is to use as many of your recipes as I possibly can. Aw...I hope you succeed the next time. Just wanted to compliment your beautiful blog. 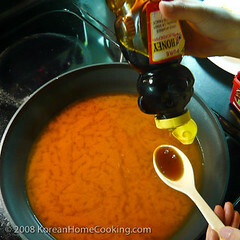 I found your blog a while ago while googling for recipes for tteokbokki. I finally made the tteokbokki following your recipe last week and it came out very nicely! Thank you so much for sharing. 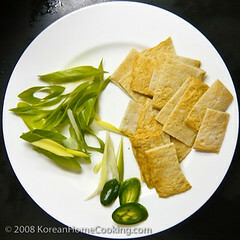 I think I will try to make Kimchi pancake next. Just one question on tteokbokki - are you suppose to cook it until the inside of the tteok is a bit red as well, or do you just rely on the flavour of the sauce hanging to the tteok? Hi Vivi, Thanks for your comments. 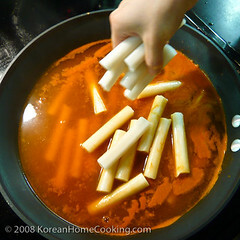 When you make tteobbokki, you don't want to overcook the rice cakes because they are not as chewy if overcooked. At the same time, you don't want them to be hard on your teeth. The rice cakes are done when they are not hard inside. The sauce may not penetrate all the way inside but it's ok.
Much, much better than the Korean restaurant version (that one has too much sugar!!!). 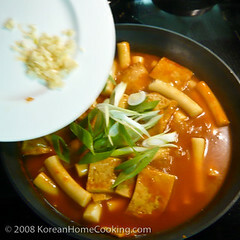 I think I can now cook better ttoekbokki than my Korean friend....hehehehe!!! thou i am a filipino but i love everything about korean especially their food coz cooking & baking is my passion.lastnight i tried cooking Dae-ji bulgogi & mae-un-tang(hope i spelled correctly)and it was a hit among my family,they really loved it that's why i'm inspired more to have more recipes to try.i'm glad i searched the right one & your Tteok bokki sounds good to me for a snack.i will really try this one.thank you . i've tried it and it is very delicious. Hello! thanks for the recipe! I've tried it and the sauce is very nice.. but the rice cakes are not very chewy :( Can I ask roughly how long do you need to cook the rice cakes? Hi all - thanks for your comments! how long to cook rice cake (ttuck) really depends on the ttuck itself. Some bakeries or brands make their ttuck very hard. In that case, you want to soak them in water for at least 30 minutes and then add to the sauce. Cook until they turn soft and chewy. The best way is not to stick with a fixed cooking time but to monitor your ttuck as you are cooking, especially if you are using ttuck you haven't cooked with before. I agree! This is how I make it too! except I am lazy to make oddeng broth so I just put some fish sauce to accommodate the flavor but this is how professionals make 떡복이 in the street and 분식집 although they use sugar instead of honey because it is cheaper.. hahahaha well done! Thank you for this recipe. I tried this today, and my sister said this is better than my first two attempts, where I tried different recipes. I didn't add the second tbsp of honey, but i could taste why honey is better than using sugar. Thank you again. I am so excited to try this recipe!!! I have longed to try tteokbokki and the Chinese store here JUST got gochujang! For rice cakes, i only found japanese kirimochi...do you think that will still work? There is no where here to buy many Korean ingredients. I want the round rice cakes! Haha. Thank you this recipe though! I'll try it tonight! I love Tteok Bok Kki. I haven't found a place in my local area that makes them :( My husband has an allergy to seafood is there anything I can use in place of the fish cakes? @Cheryl, you can substitute fish cake with beef. Slice it thin or make it as strips. This will make it similar to Royal Tteok Bok Kki which is mainly made of beef and vegetables and no fish, but with spicy gochujang sauce. I'm reading up on ddokbokki recipes, coz there are many variations, though they generally have the same gist. Instead of using fish broth, can I boil anchovies instead? @Joyceneoh - yes, you can substitute fish broth with anchovy broth. If you have a piece of dry kelp, add that too. it's surprisingly simple as long as you prep before hand, and the flavors are just ommmnomnomnom delicious. Thank You so much for posting this recipe! The sauce came out DELICOUS... the only problem that I had was that even though I soaked the rice cakes for 20 mins and added them to the boiling water/broth, they never got soft or chewy enough. My favorite thing is the texture of the rice cakes, so I was wondering if you could help me figure out what I could do to make them soft. Should I boil the rice cakes, first, and then add them to the broth water mixture? Any advice would help a ton! 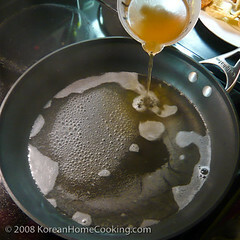 S_Kim, if your rice cake is too hard, try boiling it in a separate pot before adding the rice cakes to the sauce. Good luck! IS there any difference when you are using frozen dduk? Just made this, following your receipe- and it came out perfect.